A 75th birthday is a milestone that begs for a celebration - creative 75th birthday party favors are the perfect finishing touch to an amazing event! If you're looking for fun and unique party favors, you're in the right place! 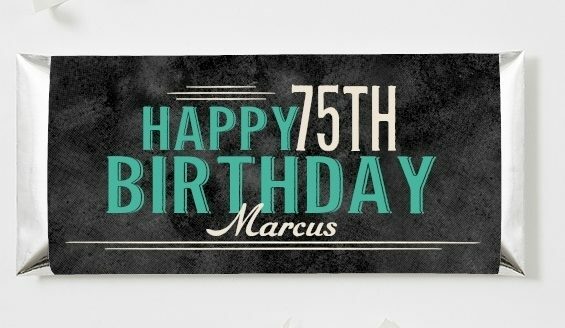 I've highlighted some of the best 75th birthday party favors - read on to choose your favorites. Personalized party favors are a fabulous way to put a special touch on favors! Personalized favors are just so impressive - and they're not as expensive as you might think. Send your guests home with a sweet surprise! Delightful personalized cookies are available in dozens of designs. Choose from chocolate dipped oreos or shortbread cookies. You can have the oreos made into cookie pops with sprinkles in your choice of colors. Each cookie comes individually wrapped, so you'll save time when getting ready for the party. A delicious and cute party favor that your guests will love. 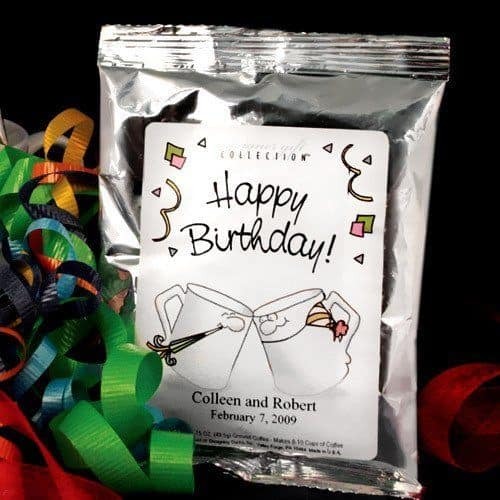 Personalized cookie party favors available at Zazzle. Who doesn't like chocolate? Send your guests home with a sweet treat - a full-size candy bar all wrapped up in a personalized label! Cute personalized candy bar wrappers are available in pink and teal. Use double-sided tape or glue to secure the wrapper to the candy bar. This design is also available on other party favors such as cigar labels, beer bottle labels, wine bottle labels and water bottle labels. Customized candy bar wrappers available at Personalization Mall. If you'd prefer miniature-sized candy labels, check out the selection at Beau-Coup. Mini candy bars are perfect to add to a candy buffet or to add to treat bags. Looking for an inexpensive party favor that is sure to impress? 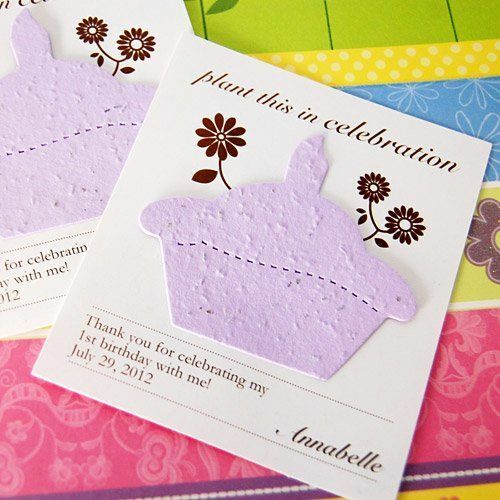 These delightful seed card favors are under $1.50 each! Your guests will enjoy planting the seeds when they get home, and the plants they grow will remind them of your special celebration long after the party is over. You can give these out alone, or add them to a party bag. They're perfect for anyone who loves to garden, or a spring or summer party. Seed card party favors available at Beau-Coup. 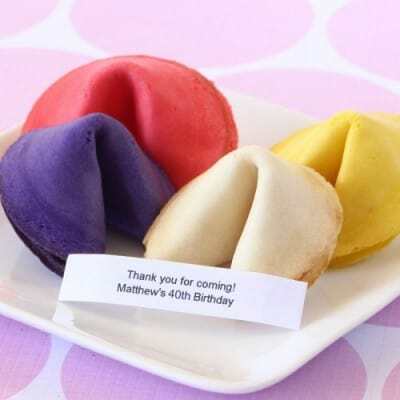 Celebrate good fortune and good times with your friends with these adorable colorful fortune cookies! Add your own 3 line fortune to thank your guests for coming. Choose from 9 bright colors and 7 fruity flavors - order several flavors to match your party colors! Each cookie is individually wrapped and stays fresh for up to 3 months. Fortune cookies are available at Beau-Coup. These adorable old-fashioned candy jars are a sweet ending to a special celebration! Choose from an extensive selection of festive birthday designs. Then add your own details (name, date, or message) to the label to create a custom party favor that’s sure to be a hit with both young and old. I like the idea of choosing candies to match your party colors – then the party favors can do double-duty as decorations. Personalized mini candy jars are available at Beau-Coup. 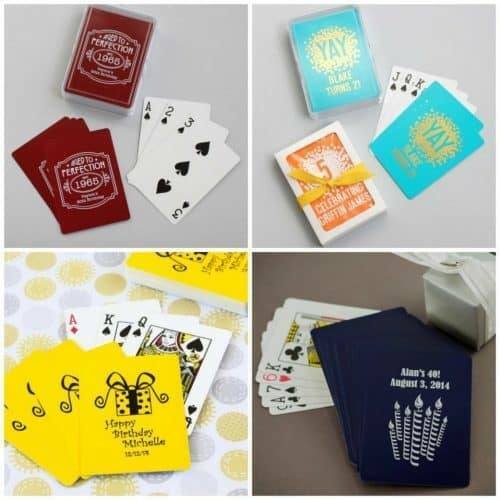 Personalized playing cards are fun take-home gifts for both adults and kids. They’re perfect for a casino or game-themed party, or for the birthday of anyone who enjoys playing cards! Personalized card decks feature your choice of 11 designs with a wide choice of background colors and imprint colors. Prices start at $4.40 each, with discounts for larger orders, with a minimum order of 25 decks. Personalized playing card party favors are available at Beau-Coup. Some party favors are geared towards adults only. Some of the options include coffee mugs, coasters, shot glasses, champagne and wine glasses, wine bottle toppers and openers, beer mugs, and lottery ticket holders with a ticket inside. If you’re looking for an elegant party favor, consider personalized wineglasses, such as the stemless ones pictured above. You can choose to have any of 26 different icons imprinted on the glass. The message of your choice will also be imprinted in any color that you choose. Prices start at under $3 each, with discounts for larger orders. There’s a minimum order of 36 wine glasses. Perfect for serving wine at the party as well as a delightful party favor! Complete the look by filling the glasses with champagne gummy bears or personalized Life Saver candies. Personalized wine glasses available at Beau-Coup. You guests will toast your good taste when you present them with these festive personalized cocktail mix party favors! Choose a margarita or cosmo mix...each mix is available in many birthday designs. A wonderful stand alone gift (around $2/each), or pair them with a mini bottle of liquor. Read the comments on the product page for more pairing options. Personalized cocktail mix available at Beau-Coup. Win points for usefulness as well as cuteness with these adorable personalized packs of coffee. You can pair them with coffee (or a tiny bottle of Bailey's Irish Cream), or simply place them in a basket near the party entrance. 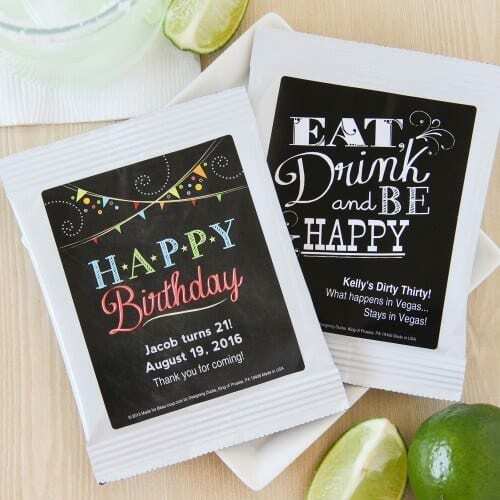 Click thru to see 9 great birthday designs - my favorite is the birthday chalkboard design (chalkboards are so trendy). Personalized coffee packs available at Beau-Coup. If you’re the crafty sort, or want to save a bit of money of party favors, consider making your own. DIY party favors definitely display an added personal touch. Mason jars are all the rage right now. Which is probably amusing to the birthday celebrant, since mason jars have been around since well before he or was born! These adorable mason jar party favors would be perfect for just about any party theme other. 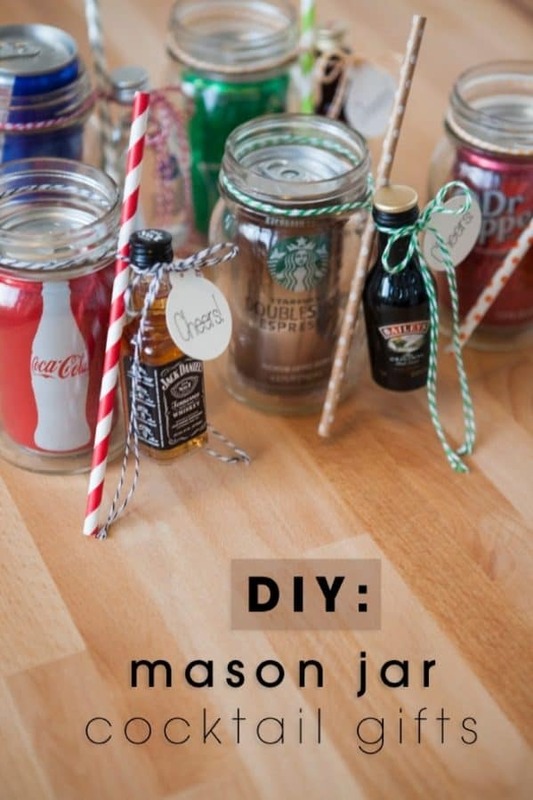 You could change the colors of the ribbons or the straws, use personalized mason jars - so many different options. Be sure to read the article on Something Turquoise as the blogger has loads of advice on choosing the right kind of soda (not just any size can will do) as well as other helpful tips. Fill a beer mug with a beer (you could give the kiddos root beer) and a few treats and you’ve got a party favor that’s fun and useful! You can probably pick up inexpensive beer mugs at your local dollar store, or ​Shindigz offers personalized beer mugs that you can have imprinted in your choice of colors and designs. You can upload your own picture, or choose from their extensive library of icons that feature hundreds of different artwork designs that you can have printed on the mugs. Prices start at around $5 each, depending upon how many you order. Simply elegant, but deceptively simple to make! These adorable candy bar favors are perfect for a tea party or other 75th birthday party for a woman. Just wrap a candy bar in a doily (or any decorative paper that you like), tie it with a matching ribbon, and add an elegant thank you card. I love the way she’s created the tiered cake stand look by simply stacking tea cups and saucers on top of each other. I found the picture on Ruffled Blog - unfortunately no details, but you might want to look there for further inspiration. Potted herb favors - Kitchen herbs in cute pots. You can either just buy some locally, or if you want to decorate your own flower pots, check out the tutorial at The Sweetest Occasion. Cake Batter Poppcorn - Mix up a batch of popcorn with sprinkles and white chocolate. Put a serving in plastic bags, and add a label that says, "Thanks for Popping By" . Easy, cute and yummy! 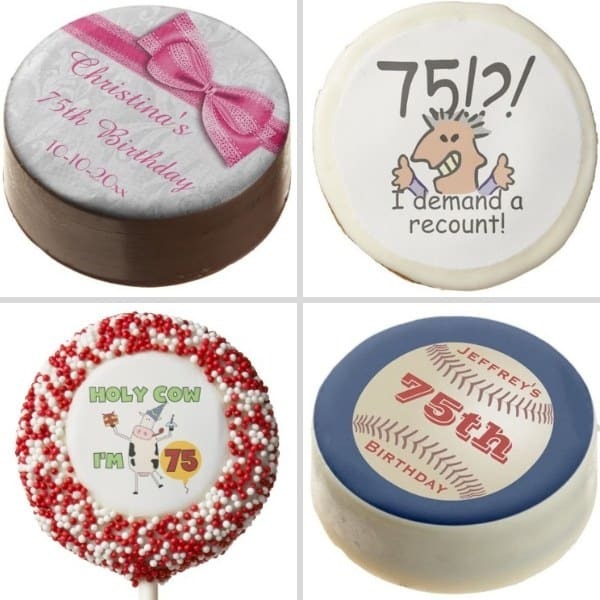 You put a lot of time and thought into creating the perfect 75th birthday celebration and ordering your party favors online is a convenient, easy and cost saving way to ensure you get the ideal mementos for your event. Scrumptious cake pops - don't freak out about the price...it's the price for one dozen cake pops! Chocolate dipped oreos - again, the price is for one dozen. If you're looking for elegant party favors, be sure to check out the offerings at Beau-Coup. I think they have the best selection of personalized glassware, such as champagne and wine glasses, as well as mason jars and milk bottles. Aged to Perfection party favors - perfect for a wine or whiskey lover, and a great choice for a man's 75th birthday party. Confetti Birthday favors - colorful and fun. They work well with just about any party style. Milestone Birthday favors - elegant designs that are just what you need for a formal party. 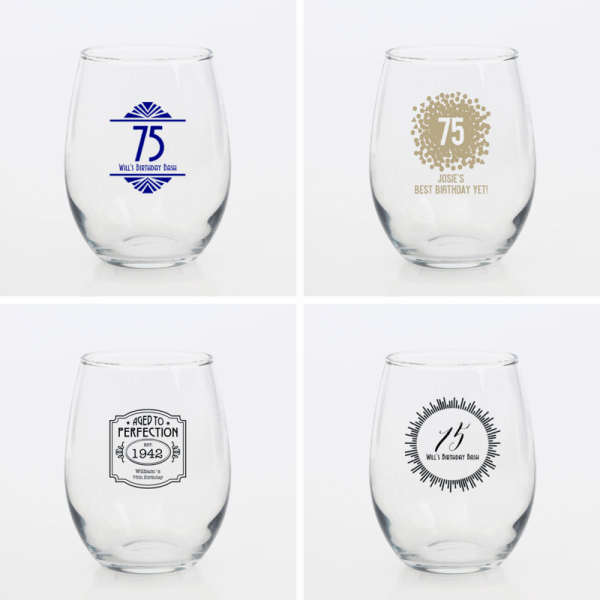 You can easily feature the number "75" on each of these designs, as well as the honoree's name and other details. Are birthday party favors necessary? No, it is a sweet custom, but party favors are not strictly required. Party favors have become relatively common recently, so your guests might expect to find a favor at the end of the party or at their place at the table. Favors don't have to be elaborate or expensive...it really it the thought that counts! 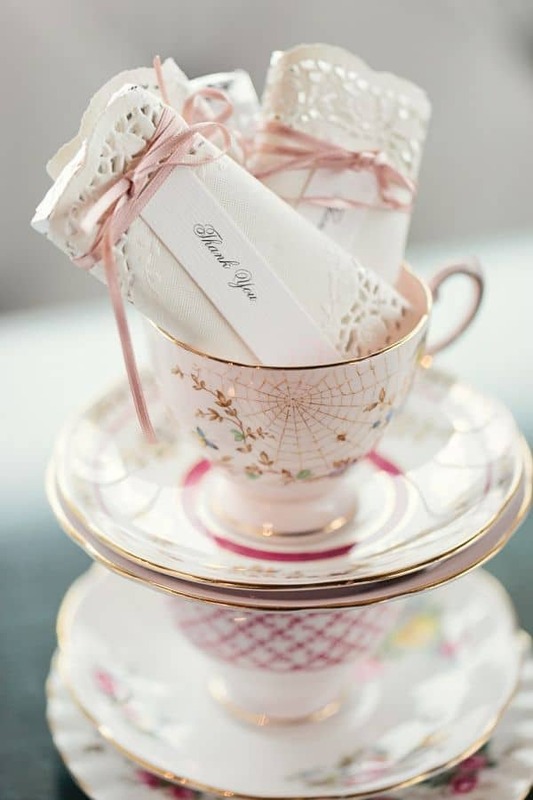 A creative and fun party favor is a fabulous way to let your guests know how much you appreciate them. What should you put in party favor bags for adults? Some of the most popular fillers include sweets, small tokens, or drink mixes. Try to pick fillers that are meaningful to the guest of honor or that relate to the party theme. For example, macadamia nuts for the Hawaii lover; tea bags for a tea party; bookmarks for the book-lover or librarian are all clever filler ideas.